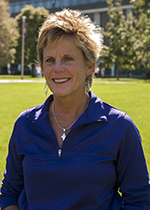 Milly MacDonell is coming into her tenth year as the Director of Campus Recreation at Western Illinois University, hoping to meet the challenges of bringing fitness into the lives of college students. Athletics has always been a part of MacDonell’s life. She played several sports in her youth and later coached before becoming director of Western’s campus recreation. She received a full volleyball scholarship to Mississippi University for Women where she studied to be a doctor. “I had gone into sciences—I love science—and I thought about pre-med and went into exercise science because that kind of combined both,” MacDonnel Said. She later chose to major in biology and her next 15 years after college involved coaching volleyball and softball at several different universities; the loss of this career eventually brought her to Western. A friend at the University of Tennessee told MacDonell about a sports management program at Western Illinois University. Here, she earned her Master’s and was given an assistantship at the recreation center. MacDonell emphasized the recreation center’s important role in maintaining student health. Yet she admitted that one of her biggest challenges is motivating students to exercise. “I think a lot of people make the mistake and I did it because I’m older and not as fit as I was and just go out and say, ‘Oh, I should be able to run 3 miles.’ And you just go out and you collapse or feel terrible or you’re extremely sore the next day that discourages people right off,” MacDonnel said. Planning events to build student relationships and working with graduate students were some of the things MacDonell described as her favorite roles. Looking toward the future, she hopes to continue providing students a resource for health and fitness.